"The language of terror, which the Kremlin is using to dictate to the world, is unacceptable!" 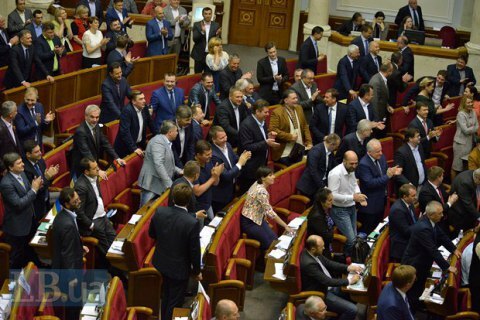 The factions of Bloc of Petro Poroshenko, People's Front, the Radical Party, Self-Help and Fatherland in Ukrainian parliament appealed on 23 January in a joint address to the parliaments of foreign states and international organizations urging to take all possible measures to put pressure on the Kremlin because of the continuation of the state-sponsored terrorism in Russia. "The Russian Federation perseveres in its attempts to destabilize the social and political situation in Ukraine through intimidation and murder of active citizens: known politicians, public figures, journalists, volunteers and activists. For this purposes, a powerful subversive-terrorist center has been organised on the territory of the Russian Federation, which employs, in particular, former convicted Ukrainian citizens, criminals and traitors from the former Ukrainian military and law enforcement," reads the statement. Another crime by the Russian special services was an attempt on the life of MP Anton Herashchenko (People's Front) an Adviser of Interior Minister, the document stresses: "However, the plans of Russian terrorists have been thwarted thanks to the professional activities of the Security Service of Ukraine and the National Police, the perpetrators were detained and are cooperating with the investigation." The statement notes that the attempted murder of the politician and the 20 July, 2016 killing of Russian dissident and journalist Pavel Sheremet were planned under the same scenario, not dissimilar to other violent acts on Ukrainian political scene. "Unfortunately, this challenge is faced not by Ukraine alone. Many of Putin's opponents have been destroyed in the territory of the EU and NATO. In particular, the High Court in London in 2016 came to the conclusion that the poisoning of former FSB officer Aleksandr Litvinenko with radioactive polonium has been agreed with the Russian leader. This presents a global terrorist threat," Ukrainian lawmakers warn. "We are outraged by the continuation of Russia's state-sponsored terrorism in Ukraine and as the international community for help and protection. We are confident that only the joint efforts of the civilized countries, European and international organizations can stop the aggressor. We need to establish as soon as possible cooperation of anti-terrorist units and information exchange on a daily basis," the statement reads. Today, Ukraine is at the forefront of the struggle for the European values of democracy, freedom and independence, shared by the whole of Europe and the free world, the document says. "We call on the UN General Assembly, the parliaments of foreign countries, parliamentary assemblies and international organizations to take all possible measures to put pressure on Russian leaders, The language of terror, which the Kremlin uses to dictate its terms to the world, is unacceptable. Democratic countries should resolutely condemn Russian aggressive hybrid warfare, particularly subversive propaganda in Ukraine and in the West." "An important element in countering Russian aggression is the preservation and strengthening of economic and political sanctions against Russia and those involved in the destabilization of the situation in Ukraine. The joint actions of Ukrainian and European institutions, whole free world has already shown to be effective. We believe that it will be so in the future," the statement concludes.